and the boat put out a tiny net to catch a few things in it. Among those things were some smallish shrimp, and I brought 3 back in a small bait bucket with an airstone. I have a 29g Biocube with nothing that will attack shrimp, and I’ve done some research on these shrimp. I couldn’t find much on their care, but I know they eat detritus, which means they’ll probably eat various foods like most shrimp will. They definitely aren’t equipped with anything unusual. Any tips on keeping them alive? The ones I have are between 2 and 4 inches long, and they seem to be in fairly good shape. They move around, wave their antennae, swim their fins, and sort of pick stuff up with their little feet, so I think they’re okay. I’m keeping them in the warm bathroom for now, and I hope they’re going to do alright. We’re going to be at the beach for a few hours tomorrow, and we should be home in Georgetown by 7. I plan to mix up some fresh saltwater, drip-acclimate them for a couple of hours, and keep them in a several-gallon bucket until I can set up my 10g quarantine. How long would you suggest I QT them? The marine biologist running the tour called them brown shrimp, but he said they get pretty big, so these must be what are sold as Gulf shrimp. Given that they’re going in a 30g with a soon-to-be-set-up 7g ‘fuge, I doubt these guys will reach full size. Any idea how big they might get? If they start getting huge and looking unhappy, I have a LFS near me that should be happy to take them and give them to someone who has a big tank. Most shrimp don’t seem particularly active, though, so I’m hoping they won’t mind the smallish tank. I plan to get some Sargassum shrimp for my tank, if not this time then another time. Are Sargassum shrimp just your basic shrimp? I don’t think there’s any kind of regulations on catching them... 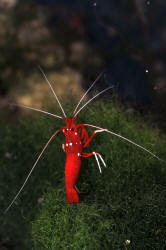 I did some research and could only find info on grass shrimp. I don’t think those are grass shrimp. Do you think it’s possible to breed them in an aquarium? I don’t think they have a planktonic stage... Do they? And a little bit of some carpeting red macroalgae. Yeah, Moody Gardens was neat. I visited the aquarium and the jungle pyramid, and they have a GORGEOUS arapaima (arapima? Arapaima? <this one> Not sure how to spell it- big muscle fish with a snout and teeth) in the jungle pond. I wonder why they don't have a Sargassum exhibit... I mean, there are loads of critters in there, they could have a tank full of frogfish and crabs and such. I now have 6 Gulf shrimp, as I bought a few more when I stopped at a bait shop. They all seem to be doing okay, although one has a problem. Its tail tip is that pink color that shrimp turn when dead.. That's bad, isn't it? It's the smallest one, and it seems healthy otherwise... Should I be concerned about the tail? I have all the lights out and don't want to bother them, plus they're hard to photograph (transparent and move a lot) but I've attached a Paint sketch of how it looks. As for the Sargassum shrimp, I don't know the scientific name, but if I Google 'Sargassum shrimp' most of the resulted photos look like them. Fairly blunt, wide rostrum, long thin claws, speckled with various Sargassum-like colors, only one pair of antennae that I can see. Most of them are golden-brown, but now and then you can find a nice red-brown-black one. I think maybe they change according to what color Sargassum they're on? Anyway, I picked up a few on the way back. They don't do much yet, they just crawl around and mostly hide. The hiding is why I don't have a photo. so they're in a 7g RubberMaid with 6 gallons of water so they can't jump as easily. The Sargassums have changed slightly to match what they're on... Not totally, they're still orange and red and yellow, but the ones who favor the mesh hatchery to sit on have gone pale and the ones on the fake plant are darker and almost greenish.